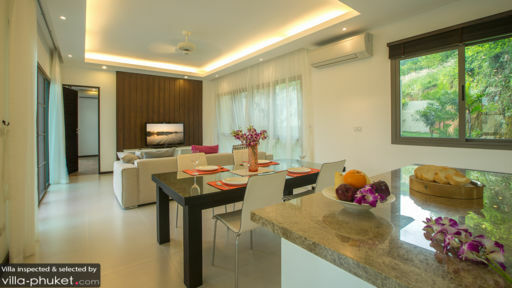 Chic, modern and well-appointed, Villa Sipura will appeal to Phuket vacationers seeking holiday homes stylised with a contemporary flair. Containing three bedrooms, a sun-soaked outdoor compound and capacious living spaces, the villa is a great bet for small group getaways. The serene vibes here means you’ll enjoy a restful holiday - but should the mood for exploration strikes, you’ll find a wide array of travel attractions located within easy reach. 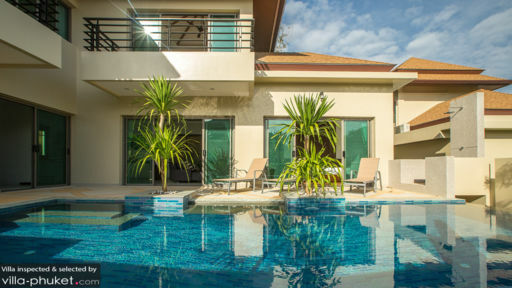 Villa Sipura sleeps six guests in three bedrooms. Each of the rooms are elegantly furnished, with off-white walls and flooring, dark wood fixtures and modern design elements. All are outfitted with king beds and private en suites, and the ground floor bedrooms enjoy easy access to the pool and garden. A sparkling pool takes center stage outdoors, serving as the central hangout for enjoying poolside libations, refreshing afternoon dips and soaking up the warm breezes. Cream coloured loungers offer sunseekers a comfortable seat, and tropical foliage framing the pool help beautify the compound. The vibes are understated and contemporary at Villa Sipura. The common areas are dressed in soothing neutral hues: a cream couch frames the glass top coffee table, silky white sheers help block out the glare of the sunlight streaming in and off-white walls and flooring complete the interiors. Featuring an open plan layout, the living area extends out to include a six seater dining suite and fully equipped kitchen. Housekeeping and security services, along with laundry facilities are available at Villa Sipura. A baby cot is available at request, while airport transfers are provided at additional cost. 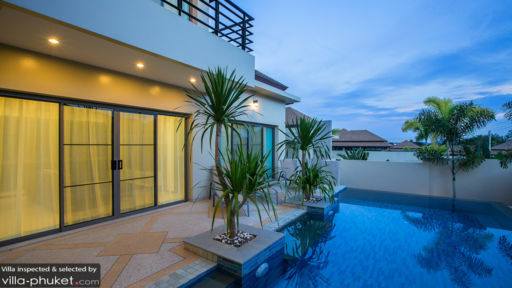 Villa Sipura puts beach lovers within close proximity to the coasts (Naiharn Beach is just a ten-minute drive away!). Dining options are aplenty, with a variety of restaurants located a stone’s throw away. Take a brief three-minute stroll out, and you’ll soon be surrounded by eateries dishing out Thai, French, German and Italian fare. Enjoy the convenience and accessibility of having supermarkets, spas and boutiques located within walking distance of the villa. Rawai Beach is situated nearby, and if you don’t mind a slightly longer ride, the beaches of Kata Noi and Kata are about a 20-minute drive away. Other locations located close by include Windmill Viewpoint, Phromthep Cape, Karon Viewpoint and the spectacular Big Buddha.